Accumulation of water in certain spots on your concrete steps can be a hazard in both hot and cold weather. Steps will be slippery when wet or icy. This moisture accumulation may be happening because of an uneven area on your concrete steps. 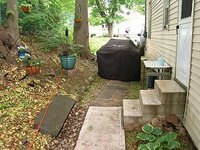 The lower spots on each concrete step can be leveled to eliminate this problem. Anyone can level concrete steps, but you must follow preparation as well as leveling instructions and exercise patience. With a grease cutter, clean the areas where you will be working, to remove all dirt and debris. A basic grease cutter or concrete cleaner can be purchased at most hardware stores and costs anywhere from $4 to $15. Use a sturdy wire brush to scuff up the concrete area that you will be leveling. Then vacuum the area with a Shop-Vac to remove all the debris. Grind into the concrete a bit around the edges of the area you are leveling to create a 1/16-inch high shoulder. Pour extra compound into the shoulder you have created so the compound will go on thicker. This increases the strength of the compound and adds durability to your newly leveled steps. Use a concrete grinder that is appropriate for your specific needs. Slightly dampen the area you are leveling. Mix Portland cement and water to a paint-like consistency. Use a paintbrush to brush this on the area to be leveled. This is going to help your concrete compound to stick to the existing concrete steps. This will also help to create a permanent and leveled patch. Mix a small amount of sand into the concrete compound to make it less slippery when it is dry. Dip your trowel blade into clean water. Spread the concrete compound onto the area you are leveling. Let the compound harden a bit before applying a second coat with your trowel. Dip the trowel in water before each coating. A trowel is an essential tool when working with concrete. Make sure the compound is completely smooth and level with the rest of the concrete steps. Span a straight edge or level across your step to see that it touches the concrete evenly from one side of the steps to the other. After your steps are leveled, allow the steps to dry or cure untouched for a full day. A two-part epoxy formulation for your concrete compound is a good choice for durability. Take precautions to prevent getting the compound on your skin. Be careful not to breathe in too much of the toxic fumes that may be released while working on this project. If you skip the preparation step, your leveled concrete will not last long.